The town continues to treat municipal street trees to protect against Emerald Ash Borer (EAB). However, the EAB infestation has had a devastating effect on our woodlands. Most, if not all of the town’s 43,000 woodland ash trees are now dead or dying. The town is following best forest management practices to remove dead and dying ash trees to reduce the risk to the public and to help our woodlands regrow. Trees that pose a safety hazard to properties and to people using the trails are being removed. Woodlands with more than 50 per cent ash population were the priority and were managed first. Now that the hazard abatement program has been completed in these woodlands, the town begins removals in the woodlands with less than 50 per cent ash population. Trails may be closed intermittently as tree removals take place. The town will also be removing hazard ash trees on behalf of the Region of Halton from the region's Southeast Wastewater Treatment plant property at Winston Churchill Boulevard and Lakeshore Road. This work should be completed by April 1, 2019. There will be a significant change in the appearance of the woodlands following tree removals. Logs, branches and wood debris left on the forest floor will eventually break down, nourishing the soil, and aid in the natural regrowth of shrubs and trees. Select sites will receive enhanced and/or intensive regeneration and replanting. Review the 2019 Woodlands Hazard Abatement program map (pdf). For more information, review our Frequently Asked Questions (pdf). If you wish to report a dead tree that appears to be an immediate hazard, please contact ServiceOakville. 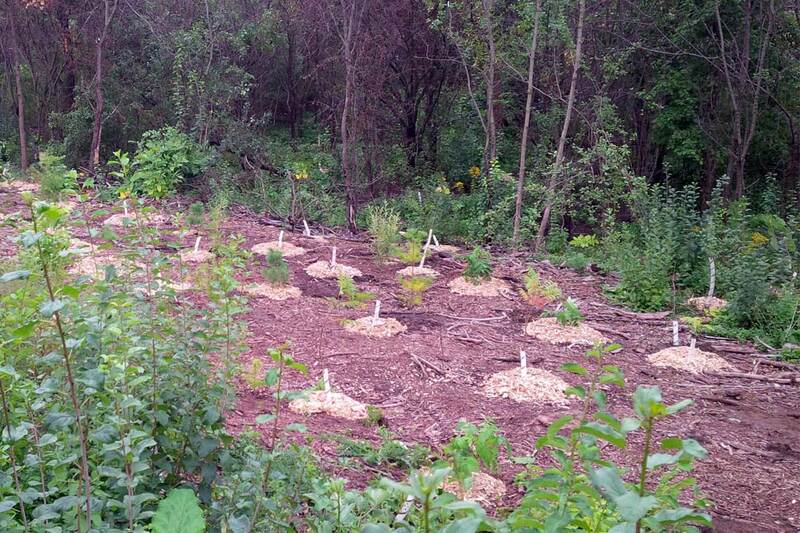 We're helping our woodlands regrow after the impact of EAB. While natural regeneration will account for most of the regrowth in the woodlands, portions of select sites have been identified for enhanced and/or intensive regeneration and replanting. The type and amount of regeneration for each area is determined by a silvicultural prescription. A silvicultural prescription is a document written by a Registered Professional Forester that describes the best forest management plans for the site, taking into consideration the woodland's characteristics, history and health, location and accessibility, density of invasive plants, and new growth potential. The removal of invasive plants, such as buckthorn, is an important part of regeneration activities as it provides growing space for newly planted trees and increases the success of native tree growth. Areas identified for prime site are monitored and tended for up to five years to encourage successful growth, by mulching, watering, installing rodent protection and replanting as necessary. Regrowth occurs naturally from seeds, root suckers, and sprouting stumps. Logs, branches and wood debris are left on the forest floor to decompose, nourish the soil, and aid in the natural regrowth of shrubs and trees. In woodlands, natural regeneration is the most common method of regrowth. These areas are left alone to regrow and do not require any additional work. Where ash trees comprised more than half of the forest canopy, and where there is little young growth of other trees, enhanced regeneration is used to encourage the establishment of native species. This includes buckthorn control and strategically planted trees where they are most likely to grow and survive unaided. Where there is significant buckthorn infestation and/or little opportunity for natural regeneration, regrowth is aided by intensive planting and maintenance. Up to 2,400 trees and shrubs per hectare (1,000 per acre) are planted and include a variety of species and sizes from seedlings to larger saplings. Dead and dying trees can become structurally unsound. If you have an untreated ash tree on your property, it will inevitably die. Remove untreated ash trees and replace with a different species. Doing nothing may put you and your property at risk. Take part in a community tree planting or visit the tree planting page for ideas on native trees you can plant in your own yard. For information on the Backyard Tree Planting Program or community tree planting events visit Oakvillegreen. By following best forest management practices, the Town of Oakville is the first lower-tier municipality in Canada to have all 280 of its woodlands achieve Forest Stewardship Council® (FSC®) certification through the Eastern Ontario Model Forest's (EOMF) Forest Certification program. The FSC® is an international, membership-based, non-profit organization that supports environmentally appropriate, socially beneficial, and economically viable management of the world's forests. The EOMF is a not-for-profit, charitable organization. The EOMF works with government, landowners, industry, First Nations, non-government organizations and others to develop new ways to sustain and manage our forest resources. The model forest provides a unique forum where forest users can build partnerships and gain a greater understanding of conflicting views, share their knowledge, and combine their expertise and resources to promote responsible resource management.